There is no denying the allure of good food when seeking out a vacation spot, but to imagine that the hotel you pick could possibly have more great dining choices than you have days of your vacation would be absurd. Well, Mandalay Bay Resort in Las Vegas has just that. The selection of restaurant options is frustrating. It’s disheartening. It is downright absurd. You see, how do they expect you to have enough time to fulfill your need for good food when they have so many great options? The only solution would be to have more than one dinner per night while on vacation or if you choose, stick around for a couple of weeks. You can do two weeks in Las Vegas, right? To help you choose which restaurants you must try at Mandalay Bay Las Vegas these are your best bets for a great meal. Don’t discount the other selections; this list is here to help you make an informed decision. Chef Johnny Church is at the helm of Chef Charlie Palmer’s kitchen in a restaurant that has long been known for its wine tower and extensive wine selection. While Wine Director Harley Carbery has done an excellent job of keeping the wine story alive, the food coming out of the kitchen is the real story. From the lionfish ceviche that has you dreaming of a beachside restaurant to the beef and octopus carpaccio that dazzle you with a sense for the finer things in life, the food at Aureole transports you to a tiny village where the local café is home to culinary treats that come from the hands of the matriarch of a family devoid of corporate clutter and infused with passion for flavors. If you make it past the bar at Libertine Social you‘ll be in for a splendid time, but the catch is that renowned mixologist Tony Abou-Ganim has crafted a cocktail list that will beckon your palate to forego food and imbibe your calories instead. Chef Shawn McClain turns the pub food concept into a social experience at Libertine Social. Try the skirt steak from the mesquite-fired grill, the fennel & sausage flatbread to start and sprinkle in some oysters, garlic knots and a few caviar fried eggs for good measure. Your drink of choice will be a Barbados Red Rum Swizzle that makes you feel like dancing in the streets of Barbados. This is the right spot if you just need to start the night with a great drink and a small snack or if you want a marathon session of cocktails and food. Chef Akira Back's enthusiasm in the kitchen is visible in the way his take on Japanese and Korean favorites prove that boundaries are made to be broken. His would be as comfortable being eaten on a street corner as it would on a white tablecloth. The yellowtail Serrano is spicy and salty and his crispy rice stands out for its signature “Screaming O” sauce. Round out the meal with scallops, eggplant and a few Kobe beef tacos that blur the lines between Korean and American cuisine. You’ll need sake — luckily, Chef Back’s own line of premium sake is visible across the bar menu. People can talk about the great views from the top of the nearby Delano Hotel and the great cocktails at Skyfall Lounge located next-door, but Alain Ducasse has a hit with his Mediterranean-inspired menu at Rivea Las Vegas that's accented with hints of California cuisine and Las Vegas flair. Don’t make any tough decisions — go with the Tour of the Riviera tasting menu and sit back and enjoy the scenery. When dinner is over, walk over to the Skyfall Lounge and enjoy the view of the Las Vegas skyline while sampling some of the best cocktails in town. Cocktails and caviar are served up well in this lounge-like space that's more a bar than a sit-down restaurant. That’s not to say that you should not have the stroganoff or a sampling of caviar. It just means that you should have some vodka with your meal. 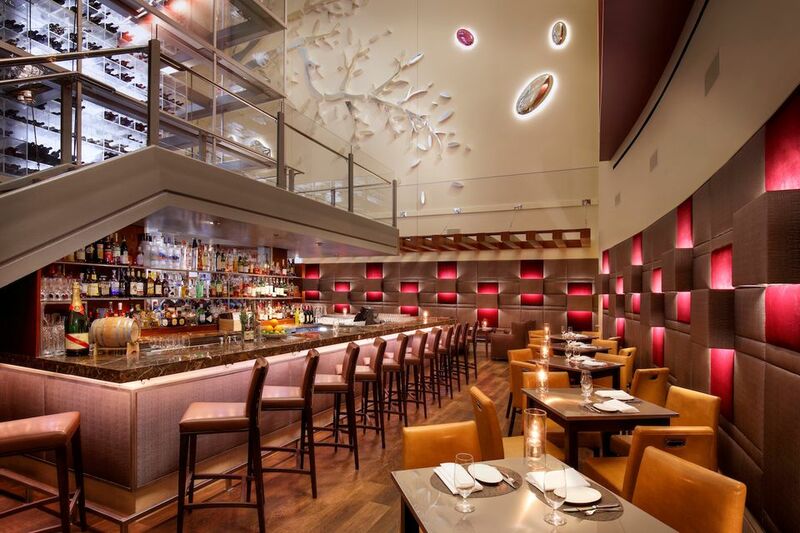 Start at the ice bar, walk into the vodka ice vault and then find a seat in the dining room. This is not just a meal, it's an entire experience. Michael Mina does steak well, and in Las Vegas, his restaurant concepts are littered all over the strip. At Stripsteak, the art of a modern steakhouse is given such a twist that it almost is a shame to call it a place for beef. The duck breast is savory, the striped bass is delicately delicious and tomahawk steak is a masterpiece. You must attempt the braised short rib ravioli, the Thai ceviche, and the “instant bacon”. Chef Rick Moonen is still at it in Las Vegas as the pioneer of sustainable fishing on the Las Vegas restaurant front. His adherence to an eco-friendly menu has garnered him acclaim among those in the know when it comes to sourcing seafood in the restaurant industry. His ability to craft a great menu and deliver an exceptional product has made him popular among those who just like good food as well. RM Seafood is a veteran on the Las Vegas strip and once you spend an evening at either the restaurant or upstairs at RX Boiler Room you’ll understand why. Open for breakfast and lunch, this casual café-style restaurant near the lobby of Delano Las Vegas delivers with such big flavors in such an unexpected way that you might be prone to dismiss it. Don’t... not when the burgers are among the best on the strip and the chicken and waffles are the perfect examples of salty, sweet, and savory. This is very good food and worth more than just one visit. Della's Kitchen is a hidden gem on the Las Vegas strip. You might still be hungry, so check out a few more restaurants that will help to satiate your cravings at Mandalay Bay Las Vegas. Try Border Grill for Mexican from chefs Susan Feniger and Mary Sue Milliken, Italian at Lupo from Wolfgang Puck, or global cuisine from Chef Huber Keller at Fleur. If you need some music with your meal try the House of Blues for some southern style cooking. Inside Mandalay Place, the shopping area adjacent to Mandalay Hotel, you can choose from gourmet burgers at Burger Bar, Baja style Mexican food at Hussong’s Cantina, casual Italian at ​Slice of Vegas, or the full-blown Irish Pub experience at Rira Irish Pub. Those seeking simple casual options can sit down at Citizens for a varied menu of comfort food or Noodle Shop for Asian specialties and if all of that does not fit your criteria there is always the Bayside Buffet for an all you can eat feast.